Update, January 12: Sorry, there’s no loyalty discount for Dark Souls Remastered. If you’ve got this far, you’ve probably worked out that despite suggestions to the contrary yesterday, Bandai Namco will not be offering a loyalty discount to players who own the original Dark Souls if they purchase the upcoming remastered version. For the best RPGs of all time, click here. Update, January 11:You’ll be able to get Dark Souls Remastered at half price if you already own the original on Steam. I’m using the word “said” there, the past tense, because since that message’s discovery on ResetEra, it has disappeared from the actual store listing. It was oddly tied to the Xbox One version, so it may simply have been attributed wrongly ahead of the PC download getting listed. The current page does still say “Dark Souls Remasted,” though, so there’s that. We’ve reached out to Bandai Namco for clarification on the discount. Dark Souls originally came out on PC in a bit of a messy state, and it took third-party patches – notably the famous DSFix – to get the game running with all the features PC players had hoped for. A proper discount for a new version featuring higher native frame rates and resolutions would make plenty of sense. Update, January 11:Oh it’s true, it’s true. 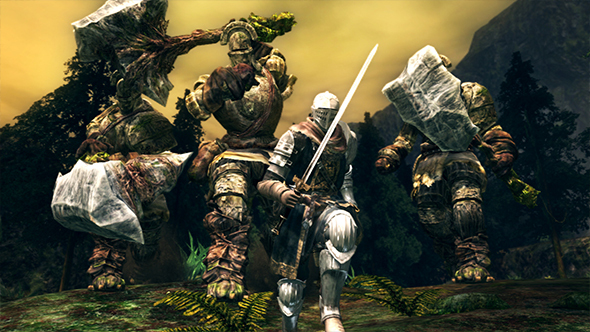 Dark Souls is getting a remaster. Confirmed today during a Nintendo Direct, Dark Souls Remastered will release on May 25 this year, and it will be coming to PC. Praise the absolute Sun. We reached out to Bandai Namco for further details. We hear that the remaster will include the (splendid) Artorias of the Abyss DLC, as well as “improved framerate and resolution from the original.” That means 60fps. Rumours before the announcement predicted it would come to PC but our platform was, understandably, missing from the Nintendo Direct trailer. Soon after the announcement, however, Bandai Namco released a trailer of their own – which you can see above – that makes clear the game is coming to Steam. Given the shoddiness of the original port and the ease with which modern controllers now work on PC, that’s thrilling news. Interestingly, the final frame of the trailer says FromSoftware hold the copyright from 2011-2018, despite them no longer being partnered with Bandai Namco. Original story, January 11:Ifsurprise Total War gamesaren’t your thing, how about surprise Dark Souls ones? Dark Souls Remastered – probably in the top percentile of requested PC games given the state of the original version on PC and its popularity – is apparently one of several announcements due at a secret Nintendo Direct due to broadcast today. Several of our own sources confirm a report onKotakuthis morning. They also note that it will release in May. For those who haven’t seen the whirlwind of fire that has been Nintendo social media the past few days, a variety of leaks suggest a Nintendo Direct was this week, with zero evidence it was actually happening. This was compounded by particularly troll-worthy posts from Nintendo social media, which now seem to have new light shed on them. Nintendo, of course, will focus on the Switch versions of their various announcements, but as Kotaku report, a different studio is apparently focusing on PS4, Xbox One and, yes, PC versions of the Dark Souls remaster. New graphics and lighting, natch, plus online upgrades to bring it to a similar player count as later games in the series. There is no information as to whether there will be any content updates as there was with the Scholar of the First Sin remaster of Dark Souls 2. True or not – and we’re leaning heavily on true – we should know in the next few hours. May is the release date if it all proves accurate, which would make a very good birthday present for me. We’ll keep you updated.